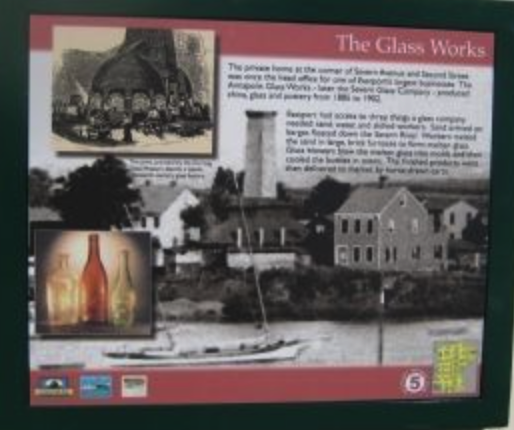 Stop #11 is the site of the Annapolis Glass Works. Some of the businesses in Eastport were not strictly maritime related, but still needed to be near the water. The Annapolis Glass Works operated on most of this block between Severn Avenue and Spa Creek between 1885 and 1902. Why would a glass factory need to be in a waterfront location? The key raw material for glass is sand. Sand mined from a quarry at the head of the Severn River was delivered to the factory by barge. Workers melted the sand in brick furnaces. 12 workers blew the molten glass into molds, creating bottles. The factory also produced china and pottery. After the glass works closed in 1902, the Braun Sausage factory opened on this site in 1908. Stop #12 is the Trumpy Yacht Yard. Between 1913 and 1974 this site hosted 3 different boat yards that built sub chasers and other naval vessels for both World Wars, the Korean War and Vietnam, along with exquisitely crafter wooden luxury yachts. The most famous of these were built by John Trumpy and Sons between 1947 and and 1974. More than a dizen of these yachts are still afloat. You can identify them by their graceful lines and the elegant golden "T" decorating the bow.